of the body; the two are ever united." I started using yoga balls about four years ago, after reading articles about their benefits and realizing I had one in my basement that I never used. (A quick Google search for yoga balls and middle school students brought up over 18,000,000 results!) I brought my yoga ball to school, blew it up, and let students who had been diagnosed with ADHD use it in class. This was towards the end of the school year and when I saw it was a hit, I decided to get a few more yoga balls over the summer and then, the year after that, I bought a couple more, until I ended up with five yoga balls. All my students loved sitting on them! From my unscientific observation, when students used the yoga balls, they were able to concentrate on their work longer and were able to pay better attention when I was talking. I really felt that they did not get as distracted and were less liable to disturb other students when they were using them. However, I did have to lay out some ground rules to ensure that everyone used the yoga balls appropriately. 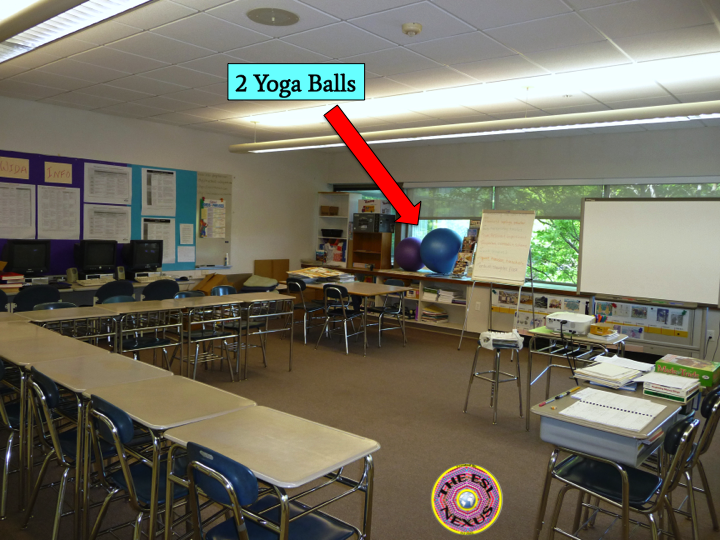 * First, determine where you will store the yoga balls—you need to make sure you have enough space in your classroom for them! Then you can figure out how many to buy. 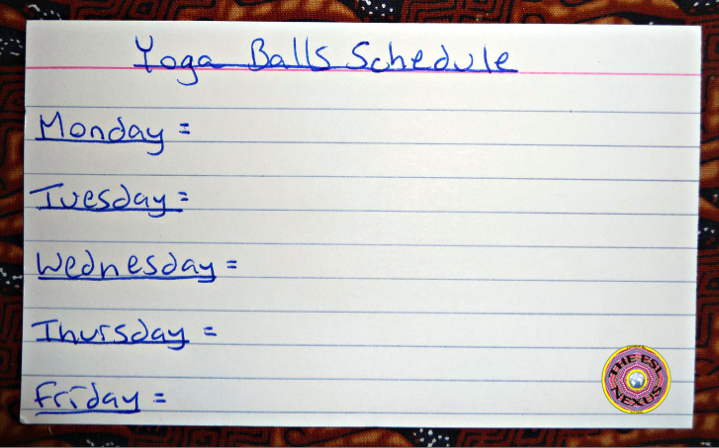 * Figure out what sizes of yoga balls you will purchase. They generally come in three sizes that are based on the height and weight of the people who will use them, but each company that makes them sizes their yoga balls slightly differently. Since I had students who were anywhere from under 5’0” to 5’10” in height, I bought medium and large-sized yoga balls. * Let your students pump up the yoga balls! I did it for the first two but then asked my students to do it; they were more than happy to help. * Do not push the plastic pins that keep the air inside the yoga balls all the way down; if you push the pins down as far as they go, then it is very difficult to pull them out when you have to pump more air inside, which eventually you will have to do. And then let the students know that they shouldn’t play with the pins, in case they accidentally pull them out and the balls start losing air. 1) Students had to keep the balls on the carpet, not the tile, because I didn’t want to risk something from the hard surface popping the balls. 3) Students had to keep both feet on the floor at all times. This was to minimize the chance of them falling off the ball, which did happen, especially in the beginning when they weren’t used to sitting on them yet. 4) Students could not bounce real high, as if they were on a pogo stick. This was both to prevent them from accidentally falling off and hurting themselves and also because it bothered my eyes when they moved up and down rapidly like that. 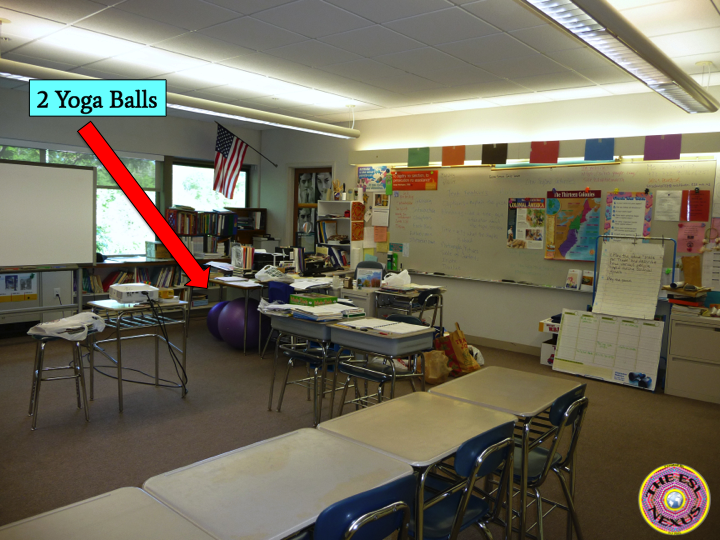 5) Students had to put the balls away themselves at the end of the class. 6) If they didn’t follow the rules, they would be subject to my usual consequences for poor behavior. I bought my yoga balls at Target but only because that was most convenient for me and I had coupons for the store. There were two brands that I liked: Reebok and Gaiam but since that was a while ago, other companies may have other brands available that you prefer. I paid around $20 per yoga ball. So what did my supervisor think about my ELLs using yoga balls? 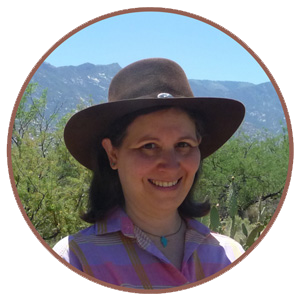 She wrote, in an observation report from January 2013: [The teacher] has a collection of stability balls which she allows her students to sit on instead of chairs. It is believed that because the brain must engage in order to keep one’s body centered on the ball, the person will be better able to concentrate. [Her] students’ level of involvement during this period seems to support this contention.” The rest of the evaluation was also very positive. I urge all teachers to get a few yoga balls and try them out with their students! Do your students sit on yoga balls? Do you have questions about using them in your class? Please leave your questions and comments below and let us know how you manage the use of yoga balls in your classroom!